If you’re in Boston, stop by and see us! I’ve been preparing two works — creating digital music and digital motion in each, if you will. Palinopsia at 2pm Saturday is my own work with choreographer Elise Knudson and dancer Pauliina Silvennoinen, for which I’ve done a music score and live visuals in Jitter (some infrared, as seen above). 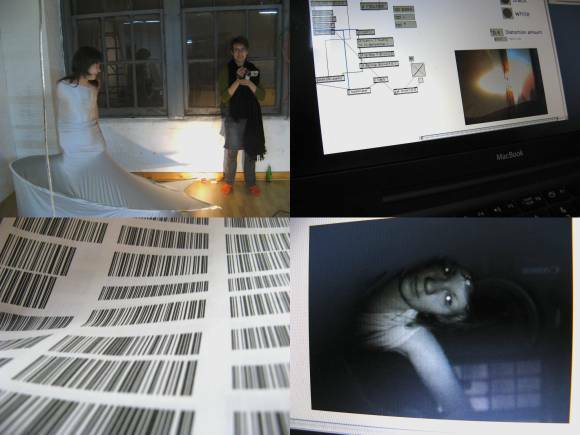 Take a Seat is Andrea Haenggi’s work in a conference room of the SHARE Swiss Consulate 11am Sunday, at which I’ll be mixing live sounds in Ableton Live and built an interactive barcode scanner that sends barcode-label messages to the dancers. And of course the whole weekend is packed with dances and lectures and other good stuff. If you’re there, do introduce yourselves. If not, I hope to report back next week.